Last night’s Twitter party was a lot of fun! 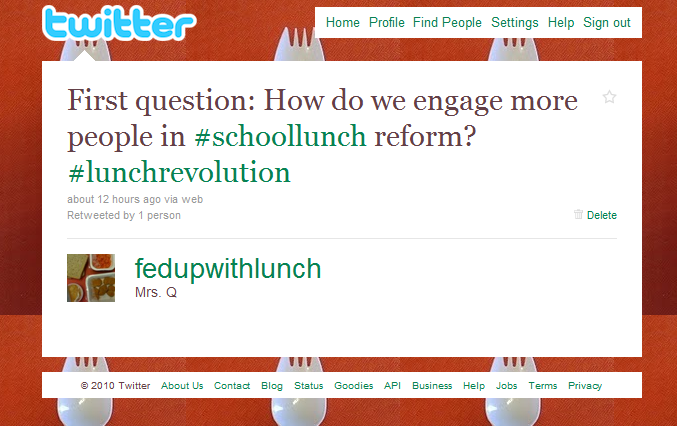 We started a trending topic (TT) (#lunchrevolution) in Canada (here’s a screenshot: http://yfrog.com/jy1d3p)! What a thrill! I think that was because @scatteredmom (Notes from the Cookie Jar) who is located in Canada tweeted so much she reached her Twitter limit and got kicked out! All of a sudden she stopped tweeting and I assumed she had something to attend to at home. Then I see a new Twitter ID — she created a a new ID so that she could still participate! I couldn’t stop laughing when I saw her new ID! What dedication! 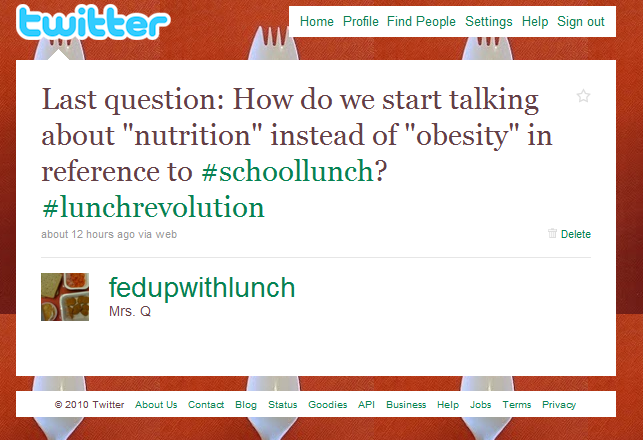 instead of “obesity” in reference to #schoollunch? 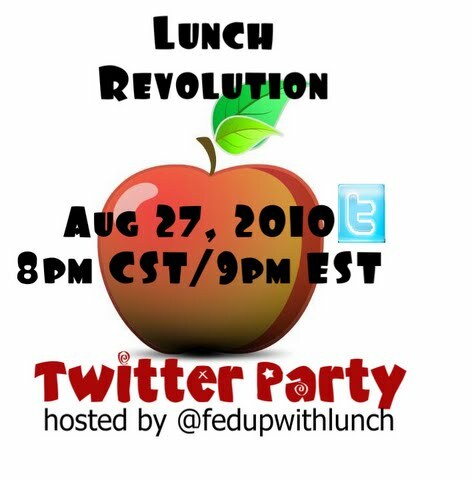 The blog party is still open through midnight Sunday night so you can still discuss School Lunch Revolution! Previous PostTwitter party tonight! Blog party answers below:Next PostBlog party winners! I wish I had been able to participate, I would love to see people's responses to the second question. I have had no luck trying to get ahold of ingredient lists from our school district. No one returns my calls. I can't believe I got kicked out. I didn't tweet THAT much-but oddly enough, Twitter didn't like me all of a sudden! We might need to make this an annual event. 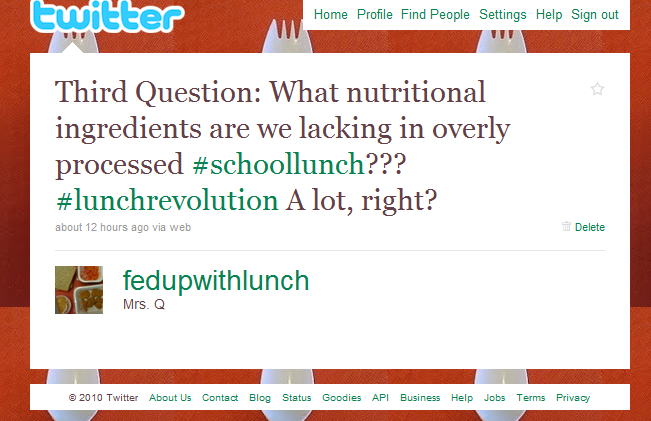 I couldn't join your tweetfest but so love the question about moving to nutrition from obesity! I couldn't agree more. If they could move from Micro nutrients to Whole Foods/Real Foods in the lunches it would help. Meaning less processed kids would start losing weight. I'm missing out…no twitter account for me, and I've been fighting a migraine for the last 2 days. Ugh. I'm missing all the fun! thank you, thank you, thank you for doing this!! i'm not a twitter girl but am so happy to hear that so many people are on the bandwagon!! and i came away from this with two pages of new ideas! and my son is super excited to go to whole foods this week and start working on prepping some lunch ideas we can pop in the freezer!! another step in the road to independent yet healthy choices…Mrs. Q, you are the BEST!! 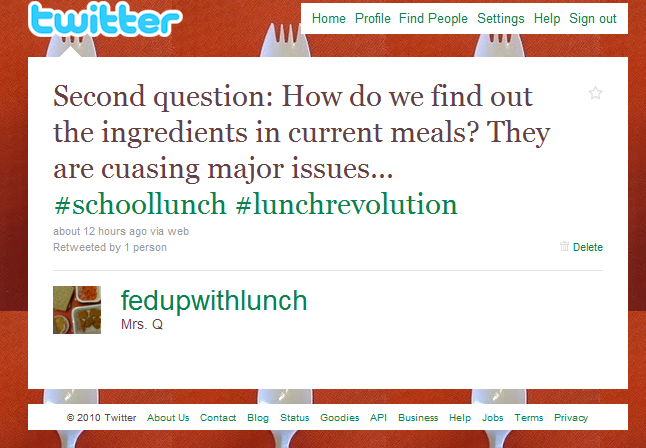 Great question about finding out the ingredients in school meals. I think federal law should require schools to post the ingredients online – like the new DC school lunch legislation does. We did get the labels for the USDA commodity foods in our school district- and have been posting them to our blog at http://www.scsfood.blogspot.com – as well as discussing the worst of the additives in them. Your schools are probably serving the same "free" foods ours is. Once parents really see what is in the food along with the salt and sugar content, they won't stand for it. Thank you for bringing attention to this issue!